Tired of boring traditionally shaped shelves? The Garden Trading Hambledon Raw Oak Shelf Ladder – Small retains the beauty of traditional wood shelves but adds a modern and quirky design twist, giving you a practical and beautiful shelving solution. 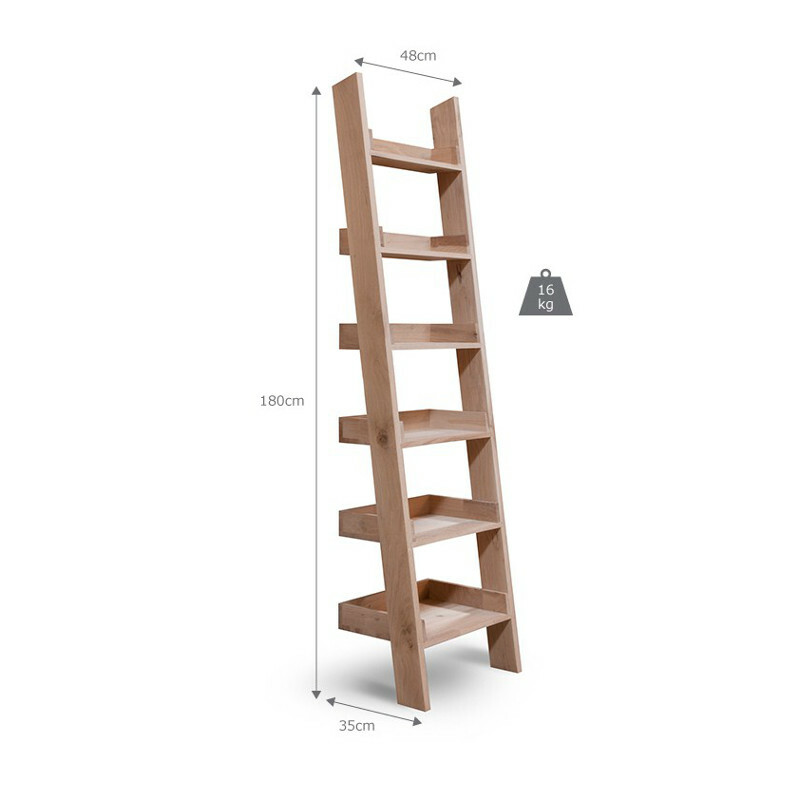 Say good bye to boring shelves and hello to the stunning and different Garden Trading Hambledon Raw Oak Shelf Ladder – Small. With its six shelves this ladder shelving unit is a unique and different way to store books, CDs, DVDs, office files or anything else that needs its own place out of the way. But this unit is not only about storage, it also makes a beautiful display shelf for you to show off your favourite photos, heirlooms, trinkets or curios. With its clean lines and simple elegance, this shelf ladder will be right at home in any room and effortless match virtually any home décor style. This shelf ladder is made from kiln-dried raw oak that has been responsibly sourced from fully sustainable forests. Thanks to the natural beauty of the wood, each unit will have its own unique appearance, colour and grain, making these already beautiful units even more special. To prolong the life and enhance the beauty and texture of this shelving unit, we recommend that you apply a hard wax oil to it on arrival and then annual before summer. These units should not be placed near radiators or heat sources as the natural material can shrink or expand when exposed to a sudden change of temperature. This unit is suitable as a freestanding unit, but can be fixed to the wall if desired. Unfortunately these fittings are not supplied with this unit. Lovely piece of furniture. Fantastic price and flawless service. Thank you. I've been looking for an Oak Ladder Shelf for months now and came across this on the internet. The pictures do not do it justice, it looks lovely and everyone comments how nice it is. It is good quality, well constructed and very sturdy. Greenfingers were good to deal with too, great communication and arrived quickly. Good quality value oak bookcase. 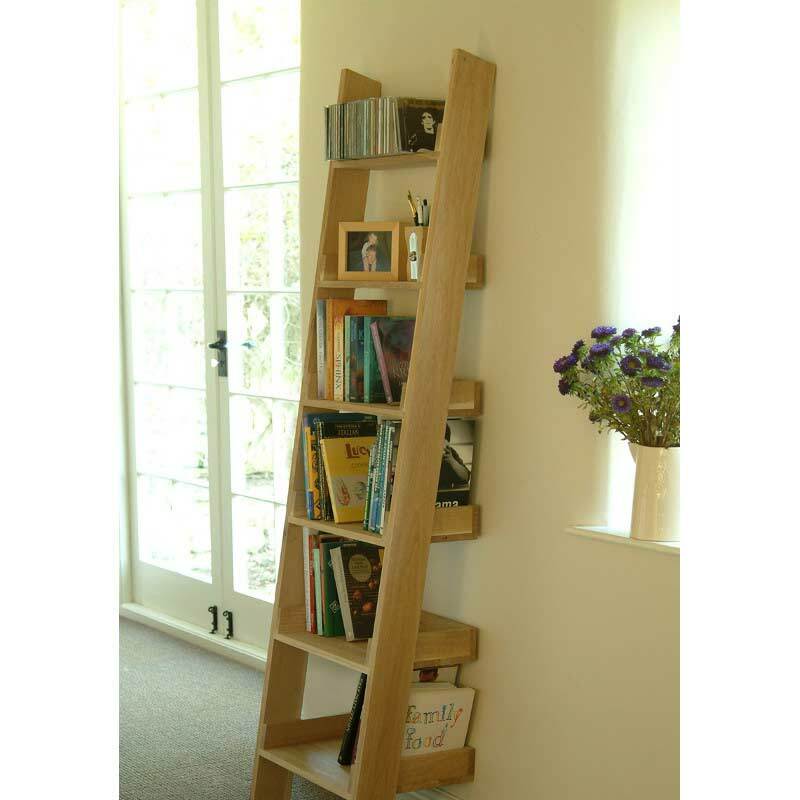 This is a great value quality oak bookcase. It comes unfinished, so I oiled it with Danish Oil. 3 coats and it has come up really nice. Would recommend. Great piece,perfectly suited for displaying .Gave it a light rub down and a coat of osmo oil.Looks brilliant. Looked around for a long time for oak shelves for my daughters bedroom. This is the best value I could find. Have used 2 coats of danish oil and it's come up amazingly. Actually it was so satisfying I'm considering buying rawoak in the future! Delivered earlier than expected, well informed, well packaged. All in all, very happy customer. I'd been looking for a solid and neat ladder self unit for some time & had seen this one on another site, but it was rather pricey. was delighted when I found it on sale elsewhere. Arrived fully assembled (fab) and well packaged (some damage) but shelves fine. hey are just perfect for where I wanted them (top of the stairs) and are really stable. thanks. Quick delivery of a good quality product. Will definitely use again.